You don’t have to lose your teeth as you get older. 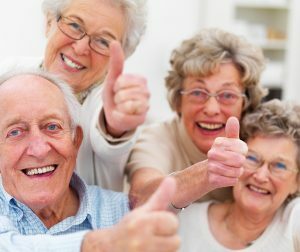 As each generation passes and the dental health and ‘dental IQ’ of the general population improves, we see more elderly people with a full complement of teeth. • The effects of gum (periodontal) disease may show more with each passing decade. This can mean more exposed root surfaces and in turn more root decay. Attention must be taken to keep the roots of the teeth clean. • As we age, the prevalence of arthritis and joint disease increases, so the actual home care (flossing and brushing) that is required by the individual may not be possible. Water Piks may help to clear away debris in these situations. • When we get older there are also physiological changes to the nerves of the teeth. The nerves inside of the teeth become smaller. This means that the teeth become less sensitive and more prone to decaying. • The elderly tend to be on more medication i.e. for Arthritis, Diabetes, and Heart disease. Many of these drugs tend to cause a condition known as Dry Mouth or Xerostomia. Dry Mouth is a big problem. Without saliva, food and debris are not washed away. If they adhere to the roots, then the prevalence of root caries will increase. I’ll discuss dry mouth (xerostomia) in a little more detail in the next blog…please stay tuned.